Brazil's national truth commission says illegal arrests, torture, executions and forced disappearances were performed systematically by state agents under Brazil's military rule. In its final report, the commission also called for the armed forces to recognise their responsibility for the "grave violations" that happened. More than 400 people were killed or disappeared between 1964 and 1985. 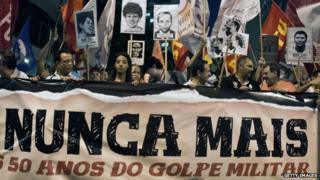 Many others, among them President Dilma Rousseff, were arrested and tortured. The seven-member truth commission spent more than two years investigating human rights abuses from the period from 1946 to 1988, with the main focus on the military era from 1964 to 1985. It delivered its final report to President Rousseff on Wednesday. In it, it identifies 377 people as responsible for human rights abuses. It says the ones who are still alive, approximately 100, should be brought to trial. The commission argues that Brazil's 1979 amnesty law does not apply to these individuals because of the grave nature of the crimes they committed. The 1979 law states that neither military officials accused of torture nor left-wing guerrillas accused of violence can face prosecution. The document lists 434 people killed under military rule. The bodies of 210 of those victims have never been located. Brazil was one of several Latin American nations where the military overthrew democratic governments in the 1960s and 70s. With support from a considerable part of Brazil's elite and its then small middle class, the generals said they were countering the very real threat of a communist insurgency. Over the next 21 years, hundreds were killed and thousands were tortured. Former members of the military reject accusations that torture was commonplace, that it was official government policy. Earlier this year a former colonel, Paulo Malhaes, told the commission in some detail how he had tortured and killed many victims. Under the protection of immunity, Malhaes, who has since died, also gave specific details about training on torture techniques he and others had received in the United Kingdom. He was one of very few former military men to give such candid evidence as the commission had no powers to subpoena witnesses. The commission says the number of victims is probably higher but it could not confirm more cases because it could not access the relevant security forces documents, many of which have reportedly been destroyed. It says that abuse and torture were official policies and widespread on military premises. It stresses that they were not isolated incidents, as members of the security forces have argued. The commission concludes that human rights violations such as illegal and arbitrary arrests, executions, torture and forced disappearances continue today because the crimes committed under military rule were not denounced, investigated or punished.